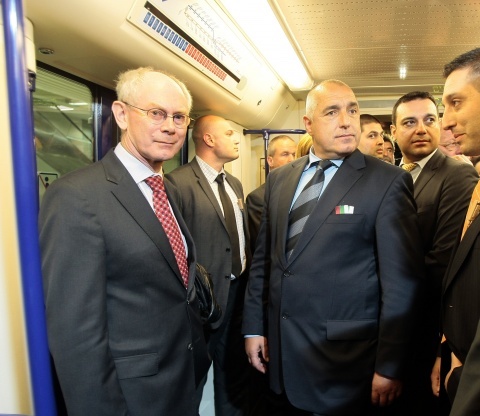 Bulgaria's PM Boyko Borisov and EU Council President Herman Van Rompuy have inaugurated the new section of the Sofia Metro, which was massively funded with EU money. Together with Bulgarian Transport Minister Ivaylo Moskovski, EU Funds Minister Tomislav Donchev, and Sofia Mayor Yordanka Fandakova, Borisov and and Van Rompuy opened the 2.4 km section of the first line of the Sofia Metro. The new section links the one operational line from the downtown to the Tsarigradsko Shose Blvd near the Interexpo Center, and is to be extended to the Sofia International Airport. The construction of the 2.4 section with two stations cost a total of EUR 122 M, including the purchase of 18 new subway trains. The Tsarigradsko Shose Blvd metro station features a parking lot for 1 300 cars, which intended to attract commuters from the southeastern suburbs of Sofia to leave their vehicles their and to commute to the downtown by metro. The first two new subway trains will be received by the Sofia Metropolitan company in May 2012, with all 18 to be delivered by October. Six of them will be destined for the newly opened metro section, while the other twelve will be used for the second metro line which is to be launched later in 2012. The Sofia Metropolitan company, which is municipally owned, has praised its own good organization, claiming to have built the section in question at half the cost that would have been charged in other European cities. The project for the expansion of the Sofia Metro is funded through the EU Operational Program "Transport" with grants from the EU Cohesion Fund and local co-financing. The Bulgarian government has already received approval from the European Commission for the funding for the construction of the extension of the newly launched section of Metro Line 1 to the Sofia International Airport before the end of the 2007-2013 programming period. The Bulgarian authorities have already started the tender for picking a builder, and by 2014, the Sofia Metro is expected to reach the Sofia International Airport. » Forgotten Luggage Closed Metro Station "West Park"